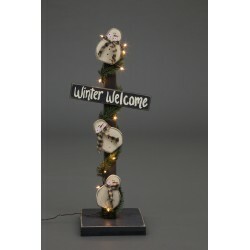 This wooden Welcome Post features 3 playful wooden snowmen on a painted post wrapped with a Faux Pine garland and then accented with Indoor/Outdoor White Lights. Winter Welcome is prominently displayed, making this one of the cutest Winter themed pieces! It's perfect for displaying indoor or outdoor! Add some rustic country charm to your home this holiday season with this handmade wooden, primitive "Winter Welcome" lighted snowmen post. A delightful addition to your Entry Way, Living Room, or Front Porch. Crafted by Pennsylvania Amish. Self Standing. Dimensions: Platform 11"W x 11"D; Post Height: 32"
Cheerful, rustic snowman lighted sign. Lights included.